Band performance times have been announced for the first annual Chicago Open Air Festival. The three-day music, craft beer and Gourmet Man Food festival held July 15, 16 and 17 at Toyota Park in Bridgeview, IL, just outside Chicago will feature a spectacular music lineup with more than 40 bands on two stages, Gourmet Man Food featuring local and regional cuisine, craft beer from the region, as well as additional entertainment and fan experiences. 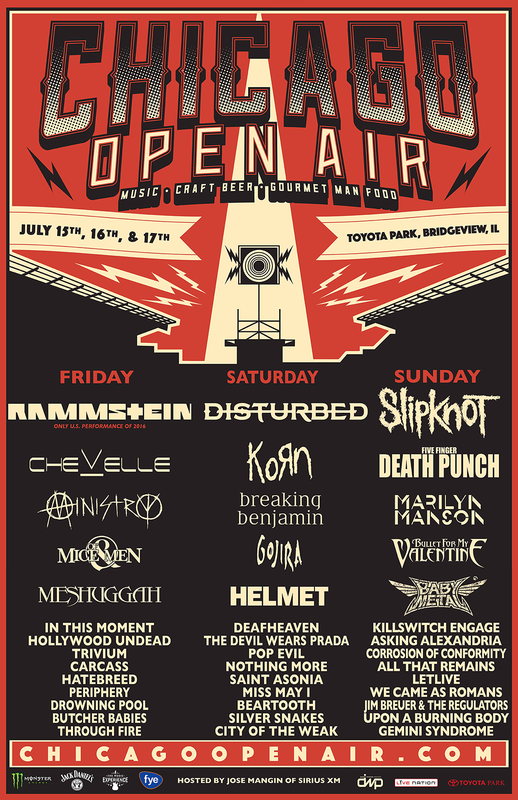 Chicago Open Air will feature headlining performances from Rammstein (the group’s only 2016 U.S. performance and first Chicago show since 2012), Chicago’s own Disturbed (who recently returned from a 4-year hiatus with their #1 album Immortalized), and global rock juggernauts Slipknot, along with Chevelle, Korn, Five Finger Death Punch, Ministry, Breaking Benjamin, Marilyn Manson, Of Mice & Men, and many more. Weekend General Admission and VIP tickets--as well as a limited number of single day tickets--are on sale now at www.ChicagoOpenAir.com. The festivities commence with the Chicago Open Air Inaugural Kickoff Dinner presented by Chicago's Goose & Fox and hosted by Jose Mangin of SiriusXM on Thursday, July 14 at 6:00 PM. The BYOB dinner will feature five courses with seasonal and local ingredients from Midwestern farmers for $75.00. An extremely limited number of tickets are still available at http://www.brownpapertickets.com/event/2560621. Also Thursday night--starting at 7:00 PM--the official Chicago Open Air Festival Pre-Party presented by 95 WIIL Rock and 100.7 QRock at Concord Music Hall will be headlined by Otep, with Shaman’s Harvest, Islander and Through Fire supporting. Tickets are available for $17 at clubtix.com. Fans are also invited to attend official Chicago Open Air After-Show Events on Friday, July 15 (Helmet with Tight Phantomz at Double Door, http://doubledoor.com/) and Saturday, July 16 (Carcass with Deafheaven at Metro,eTix). 4:25 PM Bullet For My Valentine 2:30 PM letlive. 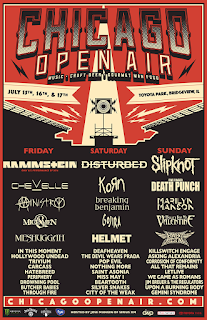 Chicago Open Air sponsors include: Monster Energy, Jack Daniel’s, f.y.e., Dyin 2 Live / Fxck Cancer, Take Me Home Animal Rescue, El Jimador Tequila, The Music Experience, Roadrunner Records, Century Media Records and more to be announced. About Live Nation Entertainment: Live Nation Entertainment (NYSE: LYV) is the world's leading live entertainment company comprised of global market leaders: Ticketmaster, Live Nation Concerts, Live Nation Media & Sponsorship and Artist Nation Management. For additional information, visit www.livenationentertainment.com. About Toyota Park: Toyota Park is located at 7000 South Harlem Avenue in Bridgeview, IL. It’s the heart of soccer for much of the Midwest and a must-see destination for world-class concerts and other sporting events. Toyota Park is conveniently located in Bridgeview near I-294 and-I-55, within an easy drive from every corner of the Chicago area. Just 15 miles from Chicago's Loop, Toyota Park offers ample parking and is served by PACE buses and shuttle links with the nearby CTA Midway Orange Line station.